International packaging supplier Ulma Packaging has developed a new air extraction system to reduce the amount of excess air in packaging and save firms money in transport costs. To overcome this challenge, many manufacturers make a hole or micro-perforations in the bag, but when the product is stored for long periods this can result in the food deteriorating. By contrast, Ulma’s VFFS Air Extraction System makes packs tighter by removing air via a patented jaw design. The company says this does not damage product like conventional options such as bag deflators, and a tighter bag means mixed products are held in place during transportation. 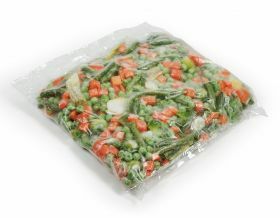 To meet the market’s need to remove as much air as possible from packs of frozen products, without affecting the integrity of the packaging, Ulma’s new patented system creates a controlled vacuum before sealing the bag – an innovative method which Ulma says doesn’t compromise packaging speeds but does reduce logistics costs. The Tight Bag system is incorporated in the horizontal cross seal area, allowing the machine to reach pack speeds of up to 90 per minute, while controlling how much air is withdrawn from the bag. Smaller boxes mean an increase in the number of packs that can be stored on pallets, saving fuel miles and preventing the risk of external contamination due to punched holes or perforations. On some products this can allow up to 20 per cent more product to be packed per box or pallet. VFFS business manager at Ulma, Steve Brooks, said: “Our patented air extraction system is perfect for the food sector – the bag is automatically sealed and is not pierced which means you get full seal integrity whilst maintaining a tight bag. The amount of air that remains in the bag can be controlled directly from the HMI panel and can be adjusted during production to suit a variety of products. Ulma’s latest technology has already been sold in Europe and is now available in the UK.